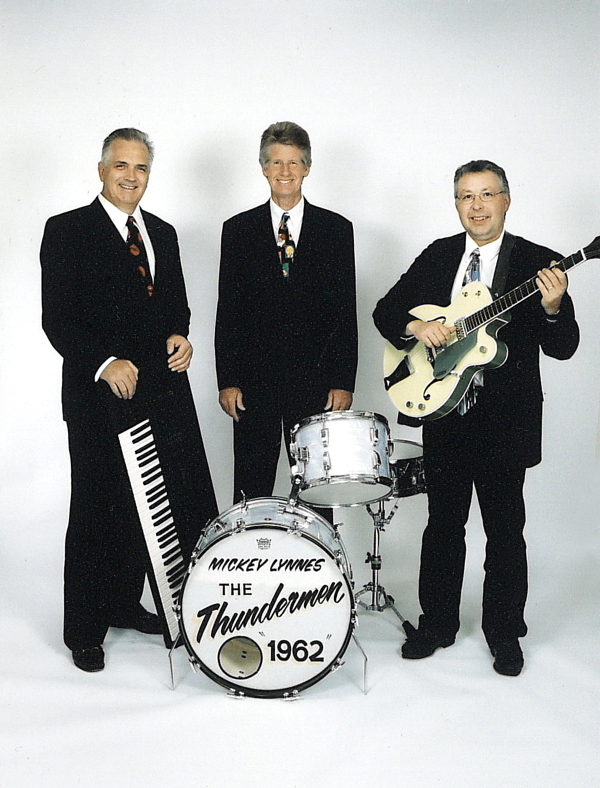 Formed in 1962, the original iteration of The Thundermen included (in no particular order) Gerry Johnson, Mickey Lynnes, Rick Hoehn, and Art Hestiken. The Thundermen aren’t your average rock band – not only because they claim to be the Chippewa Valley’s first and rock ‘n roll band, but also because they have been playing together since that time. Yeah, that’s 50 years. Mickey Lynnes and Al Fremstad first met when Mickey was a senior at Memorial High School in EC. Their high school variety show was originally supposed to feature Al singing alone and Mickey and some others playing instruments only. However, setup of the drums brought on some stage complications which led to the two playing together for the first time on stage. 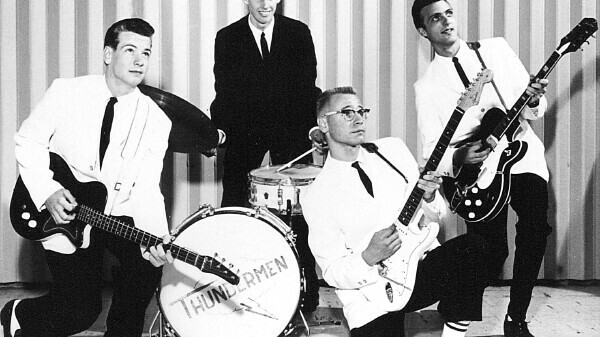 The first iteration of The Thundermen emerged in 1962 with original members Gerry Johnson, Mickey Lynnes, Rick Hoehn, and Art Hestiken. Shortly after, Art left the band. Al Fremstad reemerged as the Thundermen’s first singer and this new troupe would make up the band from 1962-1964 and be known by most as the classic line-up. During this time period, their hit “Money” became number one on WAXX radio in the Chippewa Valley and the band achieved massive popularity in the Eau Claire area as well as around the Midwest. One of the fondest memories Fremstad recalls about playing during this time was around 1963 at the Fournier’s Ballroom in EC (torn down in the 70’s) when they opened for Del Shannon, an American rock n roll star of the era, and his booking agent stated that they would never book somebody from Eau Claire because no one was good enough. After he saw The Thundermen play, though, he immediately started booking them for gigs. After several long years touring, the group decided to break up. This split allowed Fremstad and Johnson to pursue their careers while Mickey and Rick joined another established band called Michael and the Marksmen. This split was short lived, however, and the four Thunderman reunited and played shows together until June 30, 1965 when the legal drinking age was raised to 21 and the two most popular venues of the Thundermen performances were shut down. The band wouldn’t be heard from again until the 1980s. While some members stayed in the music scene during this hiatus, other didn’t until 1982 when the original lineup of Gerry, Al, Mickey, and Rick was reunited after 18 years apart, this time at Johnson’s bar: The 5 O’Clock Club. After much success in their reunification by 1991, original members Gerry Johnson and Rick Hoehn had decided to leave the band, which opened up the space for Dave Engedal and John Trygstad (both had worked with Mickey on other projects in the 70s during the band’s lull), who added a new dimension to the band – keyboards. In 1999, Dave Engedal felt like it was his time to step away from the band, opening vocals back up to Al Fremstad who eagerly rejoined the band along with guitarist Kalvin Lester, a Northwoods Wisconsin resident that added a classic vintage sound. Al says of the new guitarist, “I’ve never seen a guitar player look as enthusiastic about playing as him.” Mickey adds, “he’s not a clock watcher, he just wants to play.” After Al left the band for good in 2002, what was left what compiles The Thundermen today: Mickey Lynnes, John Trygstad, and Kalvin Lester, Mickey being the only truly original member of the band since 1959 on drums. Mickey tells of the hard work it takes to still be a Thunderman: “The equipment gets heavier every day and it’s a lot of work.” But his enthusiastic attitude and love for his music still shines through though adding, “If they can dance to it, it must be good … I get up and get ready for every job and am just ready to get out there and play.” His attitude is admiral. Although Al isn’t a permanent member of the current lineup, his presence is still strong; he offers his vocal abilities at many shows still.